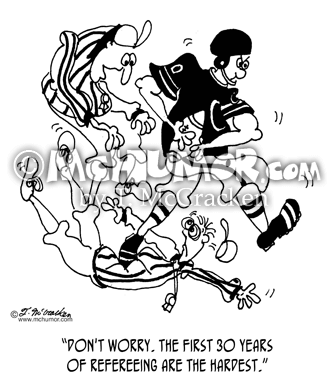 Referee Cartoon 6706: An old football referee says to a young frazzled one being run over by players says, "Don't worry. The first 30 years of refereeing are the hardest." 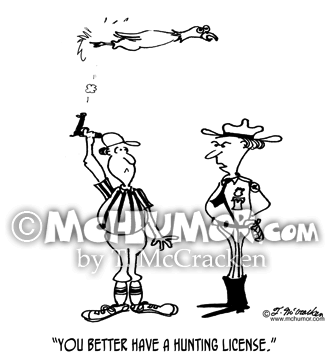 Football Cartoon 5911: Two football players get out of their cars after a wreck and yell at a police officer, "He drew me offsides! " "He was encroaching." 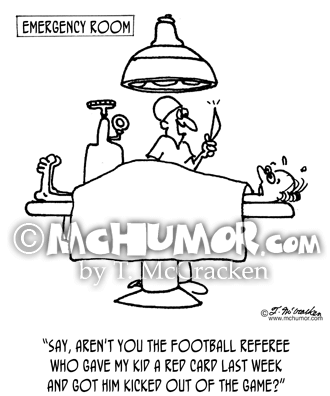 Referee Cartoon 6712: A surgeon with a vast scalpel says to a terrified patient, "Say, aren't you the football referee who gave my kid a red card last week and got him kicked out of the game?" 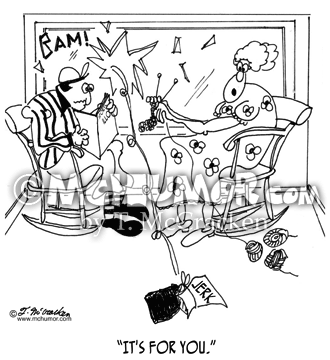 Referee Cartoon 6879: When a rock with a note saying “jerk” on it flies through a window a woman says to her husband who's a referee, "It's for you." 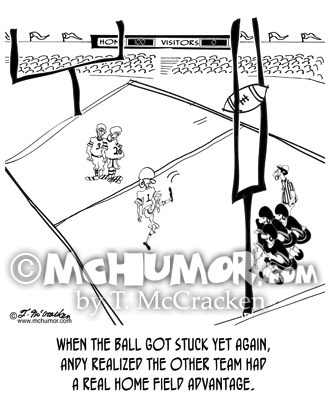 Football Cartoon 8713: "When the ball got stuck yet again, Andy realized the other team had a real home field advantage.” A player tries to kick a field goal through really skinny goal posts while the other team has fat goal posts. Football Cartoon 6637: Football players crying. 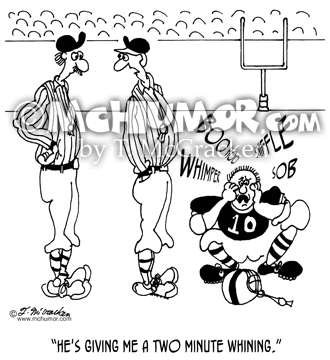 A referee says, "He's giving me a two minute whining." 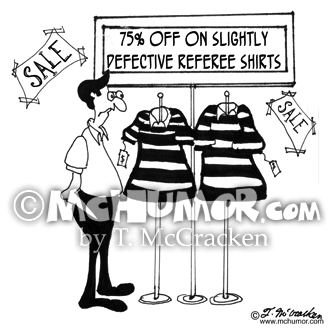 Referee Cartoon 6679: A store has a sale "75% Off on Slightly Defective Referee Shirts." All of the stripes are horizontal. 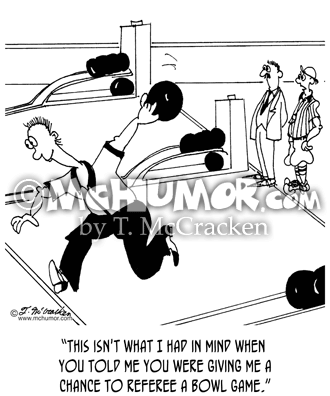 Referee Cartoon 6877: A football referee in a bowling alley says to a man in a suit, "This isn't what I had in mind when you told me you were giving me a chance to referee a bowl game." 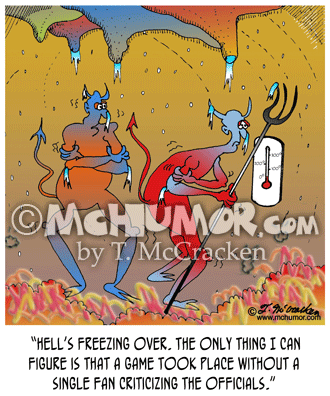 Referee Cartoon 6700: One freezing devil shivering in the middle of a snowstorm in hell says to another, "Hell’s freezing over. The only thing I can figure is that a game took place without a single fan criticizing the officials."